June 20, 2016 – Astronomers have discovered the youngest fully formed exoplanet ever detected. The discovery was made using NASA’s Kepler Space Telescope and its extended K2 mission, as well as the W. M. Keck Observatory on Mauna Kea, Hawaii. Exoplanets are planets that orbit stars beyond our sun. “Our Earth is roughly 4.5 billion years old,” said Trevor David of Caltech in Pasadena, lead author of a new study published online June 20, 2016, in the journal Nature. “By comparison, the planet K2-33b is very young. You might think of it as an infant.” David is a graduate student working with astronomer Lynne Hillenbrand, also of Caltech. “The newborn planet will help us better understand how planets form, which is important for understanding the processes that led to the formation of Earth,” said co-author Erik Petigura of Caltech. The first signals of the planet’s existence were measured by K2. 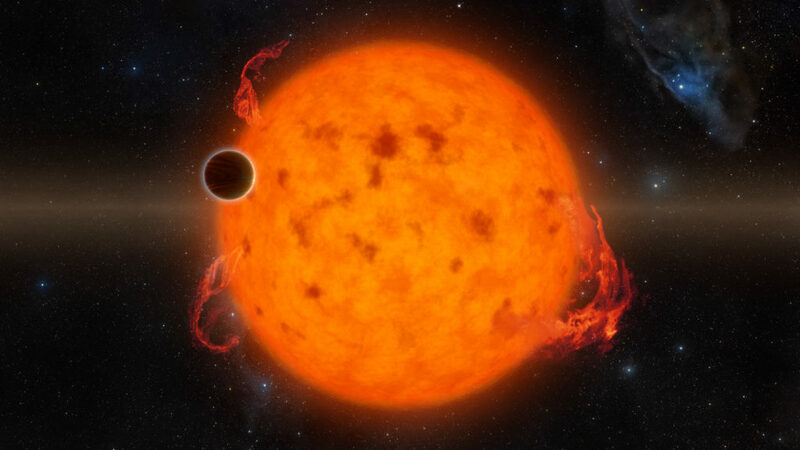 The telescope’s camera detected a periodic dimming of the light emitted by the planet’s host star, a sign that an orbiting planet could be regularly passing in front of the star and blocking the light. Data from the Keck Observatory validated that the dimming was indeed caused by a planet, and also helped confirm its youthful age. Infrared measurements from NASA’s Spitzer Space Telescope showed that the system’s star is surrounded by a thin disk of planetary debris, indicating that its planet-formation phase is wrapping up. Planets form out of thick disks of gas and dust, called protoplanetary discs, that surround young stars. A surprising feature in the discovery of K2-33b is how close the newborn planet lies to its star. The planet is nearly 10 times closer to its star than Mercury is to our sun, making it hot. While numerous older exoplanets have been found orbiting very tightly to their stars, astronomers have long struggled to understand how more massive planets like this one wind up in such small orbits. Some theories propose that it takes hundreds of millions of years to bring a planet from a more distant orbit into a close one — and therefore cannot explain K2-33b, which is quite a bit younger. 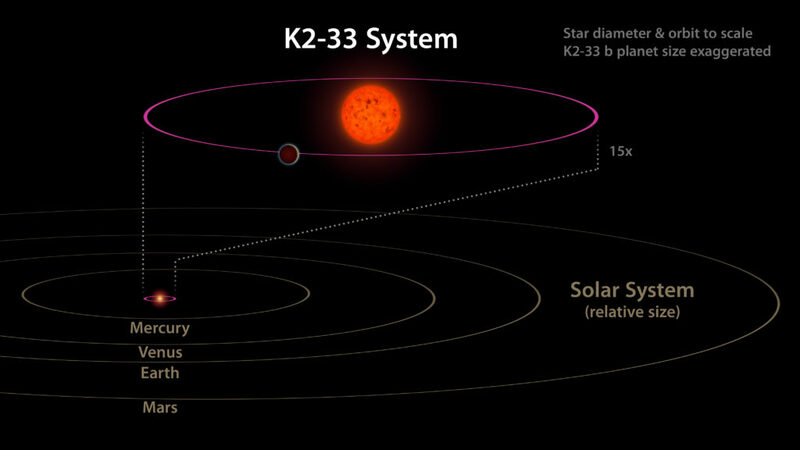 The science team says there are two main theories that may explain how K2-33b wound up so close to its star. It could have migrated there in a process called disk migration that takes hundreds of thousands of years. Or, the planet could have formed “in situ” — right where it is. The discovery of K2-33b therefore gives theorists a new data point to ponder. “The question we are answering is: Did those planets take a long time to get into those hot orbits, or could they have been there from a very early stage? We are saying, at least in this one case, that they can indeed be there at a very early stage,” he said. Ames manages the Kepler and K2 missions for NASA’s Science Mission Directorate. NASA’s Jet Propulsion Laboratory in Pasadena, California, managed Kepler mission development. Ball Aerospace & Technologies Corporation operates the flight system with support from the Laboratory for Atmospheric and Space Physics at the University of Colorado at Boulder.